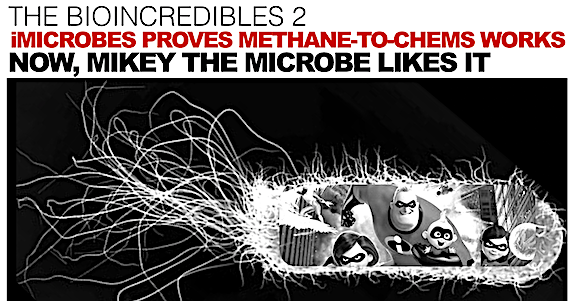 It looks like the BioIncredibles from Industrial Microbes in Emeryville, CA have come up with something that may well be in the long run more potent than even the stunning 2018 box-office performance of The Incredibles 2 from Pixar, also in Emeryville, which recently passed the billion-dollar box office mark and is now Pixar’s biggest hit, ever. The achievement of a major proof of concept is the news, in the case of Industrial Microbes — the ability to show that they can convert methane into multiple products (albeit at low efficiency, in these early days) in E. coli. We visited iMicrobes’ early days here in The BioIncredibles. Now, time for a BioIncredibles 2 update. “All the parts are working and we can get carbon to go from methane through central metabolism to more than a few target chemicals,” iMicrobes CSO Noah Helman tells The Digest. It may be less obviously theatrical than the struggles of The Incredibles to capture the Screenslaver or the Underminer, but definitely more incredible, and welcome in the real-world. We’re getting somewhere in the battle to find something that extracts net positive value from methane without combusting it into CO2. Although [methane to fuels] conversion can currently be done chemically, this requires costly and energy-intensive processes that are only feasible at large scales. As a result, small and remote sources of methane cannot be leveraged to create cost-effective transportation fuels. New biological conversion technologies offer the potential for conversion processes feasible at small scales so that small, remote sources of methane can be accessed. Furthermore, these processes would have a small carbon footprint as to provide a clear environmental advantage over traditional fuels. Specifically, this breakthrough passes the two steps of the Mikey Likes It test, a test we have stolen from LIFE cereal commercials of a generation back and re-purposed for the advanced bioeconomy. If you don’t remember the series of commercials, they featured finicky Mikey, the child who wouldn’t eat anything nourishing, until along comes LIFE cereal. Mikey likes it. In this case, the test is a two-stepper. A miracle it might be to get e.coli to utilize methane to make anything valuable at all — and Calysta and KnipBio have been hard at work on that science, too, converting methane to single cell protein as a fish feed (and the world is mighty short on sustainable fish feed that fish like to eat). But that’s only the first step of the Mikey Likes It test, because once you’ve figured out how to turn methane into a Molecule of Real Value, you have the challenge of finding someone who is both an owner of methane and in that particular MRV business. Otherwise, you have the challenge of persuading the MRV purveyor to get into the methane business, or the methane dealer to get into the MRV business. It was a challenge in biofuels to get oil companies to learn and master agricultural risk; and companies in the protein business don’t know beans, by and large, about industrial methane, and vice-versa. Not an insurmountable challenge, but definitely a hill to climb. Methane is an attractive raw material for chemical production because it is the major component of natural gas, which is inexpensive, abundant in the US, and available year-round. Renewable methane can be easily generated via the degradation of organic matter at farms, landfills, and wastewater treatment plants. So, that’s the rationale — and Industrial Micobes has been hard at it. As have the likes of Mango Materials as well. Good news that iMicrobes recently raised a seed investment round from undisclosed partners and landed a large 2-year ARPA-E grant to explore the production of acetone and isopropanol from methane, as part of a team led by Prof. Terry Papoutsakis at the University of Delaware. It’s been called methane-to-anything, or M2A, but we prefer to use the programming wildcard $ instead of A. Sounds more lucrative and less like an audio file extension format. Yes, methanophiles, Industrial Microbes and U. Delaware were awarded a $3.7M grant this year to engineer bacteria to upgrade methane into acetone and isopropanol. industrial solvents and intermediate chemicals with enormous downstream potential. When successful, the technology will be applied to many other chemical products, manufacturing ingredients used in a wide variety of familiar products from plastics to clothing fibers to the super-absorbent polymers used in diapers. Methane-owning, chemical-producing Mikey’ll like that one. The two groups bring together complementary scientific breakthroughs and technical capabilities to focus on a problem of huge practical significance. Both teams have worked on “one-carbon” metabolism in E. coli, a well-studied bacterium used at large scale to make a wide range of products. Industrial Microbes is capable of transforming methane into many valuable substrates and precursors, including methanol; meanwhile, the Papoutsakis lab has engineered similar strains to convert methanol into acetone or isopropanol. The University of Delaware (UD) is engineering new metabolic pathways to convert methane into liquid fuel. UD’s technology targets high-efficiency activation of methane to methanol without the consumption of additional energy, followed by conversion to butanol. The two-stage technology is envisioned to recapture carbon dioxide –with no carbon dioxide emissions. The team will use metabolic engineering and synthetic biology techniques to enable methanol utilization in organisms that are not natively about to do so. This modification will allow the new organism to grow on methanol, and utilize the available energy to produce butanol. Butanol is a high-energy fuel, with chemical and physical properties that are compatible with the current gasoline-based technologies for transportation. Success there was, perhaps not the slam-dunk breakthrough that ARPA-E was looking for, but we heard that that the reactor design was successful. There are other levers to pull. Getting more gas into the solution, packing more cells into the broth. But then there’s the microbe. That’s where industrial Microbes specializes. It brings us back to a conundrum of industrial biotechnology, a variant on the “feed a cold, starve a fever” adage. Do you starve a microorganism to make it do the things you want, or feed it? Algae’s many fans will recognize that key nutrient deprivation is one technique used to get algae to make more lipids; so there are reasons to consider starvation as a means to getting microbes to do the work we ask of them. And, so we’re back to Mikey Likes It, again. You see, iMicrobes comes down firmly on the side of “teaching a toddler to enjoy broccoli” as a far better pathway to eventual success, though in this case training e.coli to like methane, which they don’t naturally consume. The economics motivate us all the time to work on this. Methane is cheaper than oil, and quite a bit cheaper than sugar. But, why not simply hand this problem off to the likes of Ginkgo BioWorks or Zymergen for their large-scale advanced industrialization of the world of microbe development. Well, Zymergen for one is more about strain optimization rather than wholesale novel pathway development, but what about all this talk about industrialization and the replacement of the artisan by the machine? iMicrobes has been at it a while, and everyone knows amongst the strategics that methane is a no-brainer as a feedstock, but when is the right time, and what is the right way, to jump in. In our view, now. The major proof of concept is there, now the choosing of targets and the optimization begins. Now, it makes sense for joint development agreements to ensure that the R&D that will take place is trained on commercially relevant targets — relevant to the players out there who have access to methane and established businesses or material opportunities with, say, Molecule A or Molecule B. It doesn’t make sense to spend zillions, in our view, on a solo program — for iMicrobes to go sailing into solo development land, or for strategics to try this in their own labs. It’s the era of cooperation and partnership — that’s something the internet has facilitated in a profound way. 1+1=3 in the new math of industrial partnership, to make sure that, when it comes down to deployment, 1+1 doesn’t have to somehow equal 3 to make a molecule successful in the harsh world of commodity sales. Meanwhile, consumer push and pull will help. Baby Boomers have been unhelpful in the pursuit of sustainable materials because too many resist change, and GenXers have been willing to cross the Rubicon, generally speaking, only if the economics are a slam-dunk. But Millennials think different, to use the Apple phrase. They’re not asking for sustainable materials, they’re shifting market share to those who have them and can tell that story. And Millennials, now aged 15 to 35, are increasingly the decision-makers. All those Mikeys Like It, the wholesale improvement of lifecycle emissions. And they’ll like methane-based chemicals that sequester all that carbon a whole bunch. Which is why all those companies in Emeryville, iMicrobes among them, are the real Incredibles. More on Industrial Microbes, here.